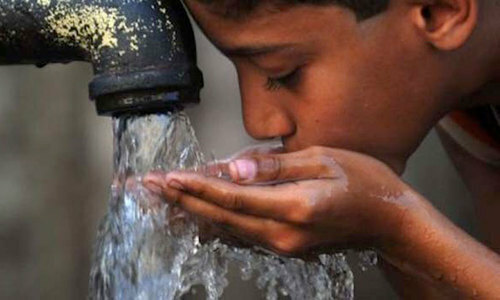 ISLAMABAD: Only 53 per cent of people would be able to get safe drinking water till 2030 if the pace of improvement of water resources remained same, lagging far behind the set goal of reaching 100 per cent population under Sustainable Development Goal (SDG). “The pace of improvement should be three-times more than the present one, which required sustainable investment in infrastructure and human resources”, said a report of Pakistan Council of Research in Water Resources (PCRWR). The report, titled ‘Water Quality Status of Major Cities of Pakistan 2015-16’, issued recently revealed that most of the samples (57 per cent) monitored were found contaminated. The other contaminations included: arsenic six per cent, turbidity eight per cent, chloride 15 per cent, nitrate six per cent, TDS 11 per cent, hardness six per cent, and iron 10 per cent. The report further disclosed that the drinking water’s quality in Sindh and Balochistan was found almost similar as in the previous monitoring years, whereas, a little improvement was recorded in some cities of Punjab and Khyber Pakhtunkhwa. Through treatment of drinking water sources of the microbial contamination only, it would be possible to make drinking water supply safe up to 80 per cent, the report said.